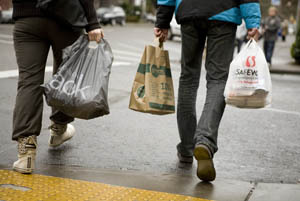 Sustainable: New biodegradable plastic bag is in the works – Finance & Commerce. We wish Cyclewoods good luck on their venture. Eliminating conventional plastic bags is a must for our environment. What they do not mention here however is where the bags biodegrade. Is it in a landfill or in a compost pile? If it will only biodegrade in a compost pile then their practicality for the average consumer will be very limited as they have no access to a compost facility. Having big corporations say the are offering the consumer the choice to pick bags to suit their life style is irresponsible. Most consumers simply do not know about this plastic tsunami that is spreading across the globe, that it takes 100’s of years to biodegrade and the mess we are leaving for our descendents. Therefore people who are in control of plastic are the ones who should be taking leadership roles in the distribution of plastic. If they were to educate their customers on reducing their plastic usage they would be praised for their leadership and environmental concern. But to do nothing and push it off to someone else is the wrong thing to to. There are 5 responses to "Sustainable: New biodegradable plastic bag is in the works". Comments are closed for this post. As per our research we need a strong and concentrated campaign to curb the pollution caused by plastics. The ban on plastic bags is very hard to put in place as packaging has taken its roots in our day to day life. Moreover, it is not possible to buy milk in a paper bag or cloth bag. The only way out of this problem can be that our old plastic should be replaced with oxo-biodegradable plastic so that it becomes biodegradable in open environment in the same way as a leaf. In conclusion,it is unfair to burden our children and grandchildren with this problem as there is something we can and should now be doing about it. If you had read over our website plasticwastesolutions.com you would have learned that using oxodegradable is the exact wrong thing to do. 1) They do not degrade in a landfill. Never mind some of the claims made by sales people, without oxygen they do not degrade. 2) They do not biodegrade. Again in spite of claims made by overzealous sales people there is no ASTM type test (not a procedure) result that shows they actually do biodegrade. 3) The oxodegradable plastic breaks down into little fragments that then blow around our environment and get into soils and water ways. We do not think we should have plastic laden soils and water ways for wildlife to live in or for us to use. 4) The UAE were sold a con job it seems and it will take a few years but they will realise they were sold a story by a sales person and they will then be looking for another change. 5) The UAE wanted to control litter with this move, but it takes 2-3 years for a bag even to break down (as designed by the oxo bag manufacturer), what this advocating is that all littered plastic items are to be left in place and not picked up. As if they are picked up, they will go to a landfill (where they will not breakdown)or an incinerator (which would be the best solution for an oxodegradabale bag. Then if you are going to incinerate the bag, why bother to put an additive in it anyway?). So the UAE is advocating for an increased litter situation in their country. They just did not do their research properly on what is the best way to control litter. 6) In a hot place like the UAE, these bags can start to break down while sitting on the shelf before they are even used. (Refer to the Tesco case last year, where Tesco realised their error and dumped oxodegradable bags). So bags breaking down early leads to double bagging, or more bags used. The oxo-additive is just making the situation worse. So no, please don’t swallow this salesman ship by the oxo-additives, go do some real research first. he does not seem to understand the real issues. lack of it had nothing to do with oxo-biodegradable technology. oxo-biodegradable bags which are properly made. plastic or bio-based plastic bags. of it does NOT get picked up. That is why oxo-bio plastic is needed. environmentally-responsible should be doing this now. I read these conclusions from Intertek on the LCA and my first impression was the author was really struggling to find good information. Who decides what ‘performed better’ meant? As Dr Williams said all the report data, test conditions should be made available for independent people to access it and publish some real comparative data, not just some ‘performed better’ statement. There is no mention of how the test was done, was there any artificial pretreatment (heat aging) done on the oxo material? How was biodegradation accessed? Was it CO2 emissions, mass reduction, CH4 emissions? We just have to ask, what advantages do oxo-degradable plastics offer? As the author states, 0.75% of plastic ends up as litter, yet they want to put oxo degradable additives in 100% of the plastic bags to cover the 0.75% that are littered? What about the other 99.25% that go to landfills or are reused. Oxo degradables serve no advantage for them at all. For the bags that are reused, oxodegradable is a disadvantage as the bag will fall to bits. The author proudly states that oxodegradable bags will not break down in a landfill and produce methane, a gas with high global warming potential. This is masking a bigger truth. What they are saying is that in a landfill the bags will not breakdown but behave just like any other conventional bag. So in this situation (where about 90+% of bags end up) oxodegradable has no advantage at all. As we, as a society with increasing natural resource pressures, go forwards, one of the better ways to get energy is the renewable energy from landfills, i.e. capture the methane and generate electricity from it. Combusting methane is a lot cleaner than combusting coal or oil, so over all collecting methane and generating electricity from that and displacing coal, could have less global warming effect. So we, in increasing numbers of places as people start to realise this, are wanting landfills to generate methane so it can be captured. The use of biodegradable materials is a much better option for our consumable, or single use plastic items. First it ought to be banning disposable plastic items and using paper or reusable items then lastly if we have to use plastic for these situations make it biodegradable plastic that will biodegrade in a landfill. This will cater for the 90+% of plastic bags, not just the 0.75% of bags the author proudly states. Mr Sharma is a salesperson for an oxo degradable product, it is natural for him to want to be seen promoting the additive. We hope he is right and that the oxo degradable plastics do biodegrade. That would be good. But we have yet to read a study of an oxodegradable plastic biodegrading in the environment without some high temperature heat treating. Manufacturers have been able to get away with green claims in the past as our society was not using so much of any one product so it did not appear to matter. However nowadays with more and more plastic being made every year, plastic bags, plastic bottles, cutlery, straws, etc to name a few just for the plastics industry, it has become very unsustainable and plastic waste is an accumulating problem, getting worse every year. It needs a serious solution and reasonably quickly. Banning disposable plastic items is a very good step, or making users pay a fee for them so they are not perceived to be free is another good step. Of the three main methods promoted to address the plastic waste issue, 1) compostable, 2) landfill-biodegradable and 3) oxodegradable, oxodegradable would seem to be at the bottom of the list for the reasons of. 1) They serve no purpose for 90+% of plastics that go to landfills. 2) They cannot be blindly recycled in mainstream plastic recycling as the recyclers will not know they are degradable and would process the plastic item like an untreated material. Then the degrading additive will get mixed into the new plastic items and we may not want them to degrade or fragment apart. A recent study by Jakubowicz 2012, concluded The results show that the incorporation of minor fractions of OBD materials in the existing recycling streams will not create a severe effect on the service life of the recyclates as long as the polymer mixture possesses a reasonable degree of stabilization. The oxobiodegradable society seem to have forgotten to mention the latter parts. What needs to happen is that stabilisers are needed to be added to the oxodegradable plastic to stop it affecting other non treated plastic. If this were done then the oxodegradable plastic probably could be recycled with other plastics in small ratios. However from a practical point, how is a recycler watching plastic waste go by on a conveyor belt going to know which plastic has the oxodegradable additive in it and which does not. They cannot be expected to know, they are looking at the recycle number on the plastic item only and sorting by that. HDPE, separated from PP, separated from PVC etc. They do not separate by oxodegradable plastics then take them aside, reprocess them and add a stabiliser to them then put them back in main stream to sell for the same low value as the conventional plastic. 3) Another point that is always mentioned as a selling point, by the oxo proponents is that the bag will ‘self degrade after their useful life or their intended use is finished’. If plastic waste was not such a serious issue, this statement would be considered humorous. Consider you have a plastic bag factory in say a country like India, who while manufacturing a nice quality bag, has no idea of where in the world these bags are going to end up not what service life the end user is going to put them to. The factory can only make a bag to a general set of specifications and thereafter the internal chemical degradation reaction is taking place. The bags may get shipped to a hot country or be exposed to a hot conditions in transit, both of which speed up the reaction rate. So those bags will have a short useful life compared to others that stay cold. The oxo seller’s implication is that the bag will degrade after the end user decides they have finished with the bag. Whereas the actual situation is the bag degradation time is set by the factory back in India, irregardless of the end user. The Tesco case supports this argument very well. The Tesco situation is as we stated it. There are numerous references on the web about this as it made such a sensation. That situation has the oxo manufacturers on the back foot with no accepted answer. 4) The simple proof of biodegradation would appear to be unanswered still. Tests by respected scientists are often cited, but the tests are carried out on thin films under higher temperature conditions not seen in the normal ambient environment. If the high temperatures are required to accelerate the fragmentation of the plastic, then ambient performance is very questionable. Performing tests on films will create a very misleading result. Films will naturally breakdown faster than a more solid section due to their high surface area to volume ratio. This deception is often carried out by people wanting to achieve a predetermined result in their favour. If Mr Sharma would like to email such a paper through for our review we will happily review it and report back. If there is actual biodegradation measured by an ASTM (or equiv) gas evolvement test in ambient conditions, on a typical plastic section, we will be gladly report it. Citing that the oxodegradable plastic will break down on the ground then biodegrade away is again misleading people. For biodegradation to occur there has to be biota present and moisture. In Africa where there is a large plastic bag litter issue, it is also very dry and sandy. Will Mr Sharma be out selling his product in those areas knowing they will not work there? 4) We certainly do not want tiny fragments of plastic floating in the ocean for marine life to eat. It is catastrophic now that so many birds and animals die every year from our plastic waste. But to let the plastic fragment into tiny piece for them to eat more doesn’t seem right. The oxodegradable would offer one benefit here however in that the large plastic items like ghost nets that animals become entangled in and starve or drown would get broken down to be a less hazard for them. Lastly to correct Mr Sharma. PWS does not endorse any product. We are very concerned about the plastic waste problem and search for effective means to deal with it. We want solutions to our plastic waste that do not leave plastic remaining for future generations to deal with. Clearly and confirmed by Mr Sharma above, oxodegradable plastics do not break down in a landfill so will remain for 100’s of years. Landfill biodegradable plastics will biodegrade in years. When we find technologies that meet our goals, we then try to educate people and organisations about our findings to bring out the truth on the products. The result of our findings to date is that the landfill-biodegradable additives currently provide the best solution to take care of our plastic waste after Reduce, Reuse and Recycle have been exhausted. If 90+% of plastic goes to landfill then landfill-biodegradable additives will take care of 90+% of plastic waste. They will not take care of the litter problem nor would they seem to address the plastic in the ocean problem, but this is not known by PWS as there are people who claim the microorganisms in the water will biodegrade the landfill-biodegradable plastic there too. If the oxo-manufacturers can unequivocally show biodegradation in an ambient environment, then perhaps plastics could be made with both a landfill-biodegradable additive and an oxodegradable additive. That way whether in a landfill or on the ground, biodegradation could occur. Mr Sharma quotes “Mr. Headifen’s expensive bags,’ in referring to landfill-biodegradable plastic bags. We do not have bags. We do not know where he got the perception of expensive from. This is again another oft cited reason given to scare people off a competing product. If Mr Sharma did his own investigation on the effectiveness and the cost of landfill-biodegradable additives he would not be saying such unsubstantiated claims. It is good that Mr Sharma and us, even though on different continents do agree on the same thing of the large problem of plastic waste and we are all on the lookout for solutions to lessen it.